that is a beautiful breakfast. Scramble and potatoes can’t be beat! Yum! Hash browns are always tough…mine aren’t ever as pretty as say, the Waffle House’s…but they still taste good….I’m always scared to add too much oil. Hashbrowns do involve some sort of learning curve . . . but what a great first couple of tries you’ve had! I’ve been getting sick of our weekend brunch lately (we had it again this past Sunday! ), and I think I’m going to mix it up this weekend!! And I’ve been craving tofu scramble . . . !!!! Mmmmm. I am not a morning person but a meal like that, the hash browns especially, makes me want to get out of bed. Yum yum! I actually haven’t tried scramble tofu before, but I’ve heard that it’s great. Yummy looks very very tasty! Yum, this looks like quite a delicious breakfast. 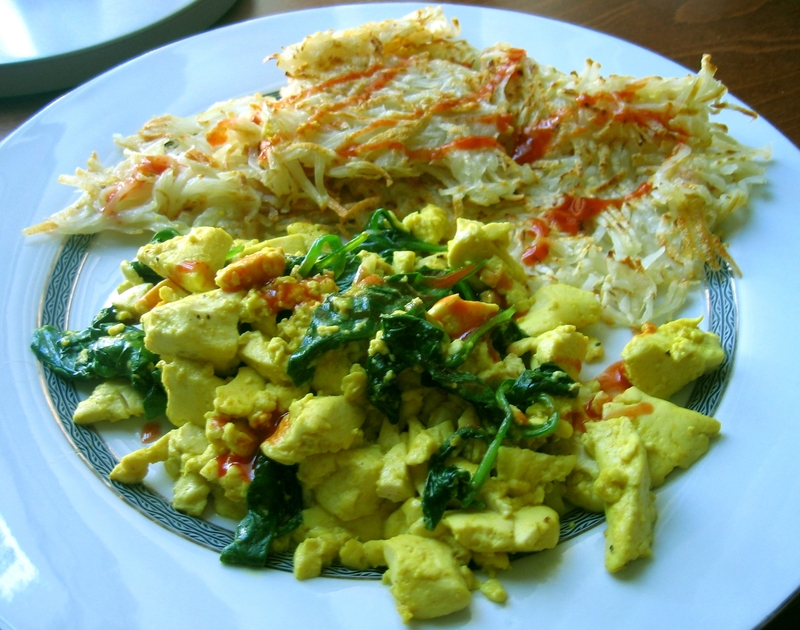 What spices did you use in your tofu scramble? Wow. Looks absolutely delicious. The perfect breakfast. Can’t wait to try it. The hash browns look perfect, and I’ve always preferred the taste of Russet over Yukon Gold. I’ll probably use Firm Tofu but I’m definitely trying this recipe right away.